This page was designed for all seeking enlightenment in some form or another. I offer advice, from my point of view. The point of view of a modern witch. I offer answers to spiritual questions; the nature of these questions can cover anything from meditation, to spell work. Only spiritual questions will be answered free. If you need to know about your love life, finances or your future in general, order a private psychic reading here. When asking a question, know that it may be printed on this page, edited, yet will not show your e-mail address. In the mailing please specify your birth date, and that you have been to this page! I have been a professional psychic for 8 years. For more on my personal history see, my personal pages. 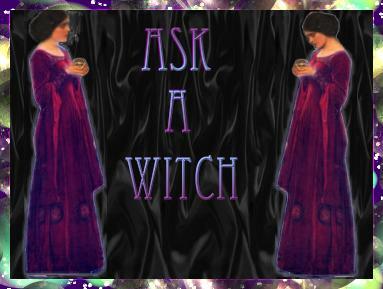 You can also visit my store for all your witchy needs and the on-line community here. To learn more about me professionally, I guide you to my Psychic Services Page. I think my house is haunted. I have a family and would really like to get rid of the feelings in our home. Is there a way that someone like me who has no experiance can clean out my house? There are many tools a beginner can use. I suggest beginning with a smudge stick made of sage and cedar. Burning this and carrying it around the house so that the smoke touches every inch can really do wonders for the feelings in any space. Also mix a solution of lemon oil, sea salt, and rose water in hot water. Cleanse all your windows and thresholds with this mixure. WHen you are done pour the liquid down all the sinks. This should really help! As well, never burn rose incense in your home, for it attracts spirits. You can get all these items at "The Occult Shop". Read past questions and advice on the Archives page. This is "Gargy" the Gargoyle. He keeps the nasties away.